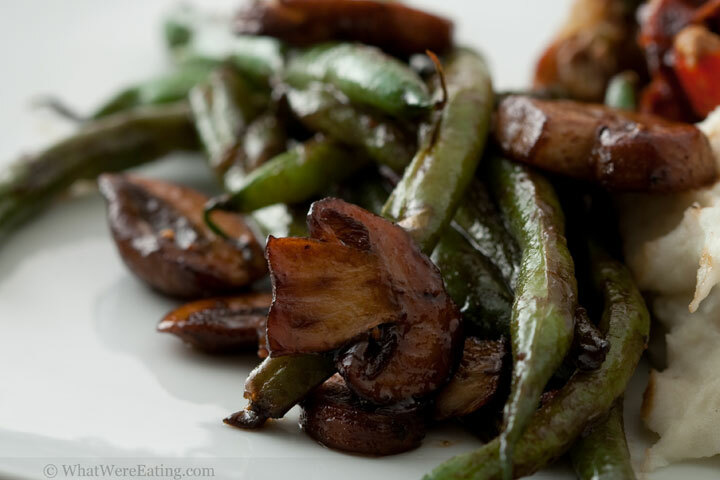 We’re eating a simple summer side-dish or crisp green beans and cremini mushrooms deglazed with balsamic vinegar. Admission: I think I could eat an entire pound of green beans myself! Seriously, I freaking LOVE green beans and have been known to eat entire meals based around them. Doesn’t matter to me if they are crisp and hardly cooked or boiled to death with bacon and onions (country style), or if they are sitting in a lovely sauce or simply tossed with a little butter, salt & pepper. Those long stringy little pods of joy brighten my day. As it happens, this is one of the many great ways I enjoy eating green beans. I hope you guys enjoy them as well! Bring a pot of water to a boil over high heat. Once boiling add a handful of salt. Stir, then add the green beans. Boil the green beans in the salted water for 5 minutes. Strain. While the water is coming to a boil, place a saute pan over medium heat. Add the oil to the pan. Once the pan and oil have preheated, about 2-3 minutes, add the mushrooms to the pan. Sprinkle with a pinch on kosher salt and freshly cracked black pepper then stir. Saute for about 6-8 minutes, stirring occasionally, until mushrooms have begun to caramelize. Add the strained green beans to the pan. Stir. Add the balsamic vinegar to deglaze the pan, stirring to scrape up any bits stuck to the bottom. Allow the vinegar to almost completely simmer away, leaving only a sweet glaze on the beans & mushrooms. Taste a green bean then adjust seasoning as desire with kosher salt and freshly cracked black pepper. Enjoy! Ooh, I just got green beans in my farm share. Thanks for the recipe… I’ll try it this week. Yum. I wish I was a member of a CSA! I’m envious, Tracey. I hope you like the green beans. They are suuuuper simple but so delicious. Looks absolutely tasty and very healthy. Thanks for the recipe, definitely gonna try it. Always looking for new ways to make green beans, yum. I’m totally with you on your green-bean-love! @peabody- me too! especially since I’ve pretty much never met a green bean I didn’t love. I made this and loved it. Green beans and mushrooms. Yummy! A big fan of green beans so I had to and tried it last night, and oh my, what an amazing recipe.